It has been reported that 11.6% - 33% of boys and 3.6% - 19% of girls suffer some kind of dental trauma before age 12. Internal staining is common following a traumatic injury to a tooth. Calcific metamorphosis is the partial or complete obliteration of the pulp following dental trauma. An interesting study of 168 traumatized, discolored, anterior teeth found that 47.6% were partially obliterated, 31.6% were totally obliterated, and 20.8% were found necrotic. Necrosis was more associated with fractured teeth, while pulpal obliteration was associated with subluxation and concussion injury. It was also noted that injuries suffered in the 1st and 2nd decades of life resulted in more pulpal obliteration, while those suffered in the 3rd decade resulted in necrosis more often. To remove this discoloration, typically endodontic therapy is performed and internal, non-vital bleaching is performed. The following case is a variation of this procedure. This 13 year old boy previously suffered a traumatic injury. Tooth #8 has discolored. The tooth is asymptomatic. Non-responsive to thermal testing, normal to percussion and probing. It was decided to perform endodontic therapy, prior to internal bleaching to improve the esthetics of this tooth. Partial pulpal obliteration is noted. A 1mm thick calcific barrier is found just below the level of the CEJ. RCT is initiated and a complete calcific barrier is noted. It was decided to perform the internal bleaching without endodontic therapy. After 1 week, pt returns and the internal bleach is removed. This tooth will be recalled to monitor vitality over time. 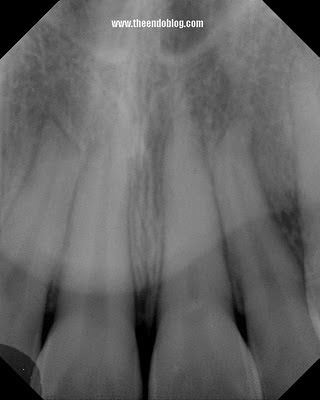 If pulpal obliteration occurs without necrosis, there may not be a need for endodontic therapy prior to internal bleaching. 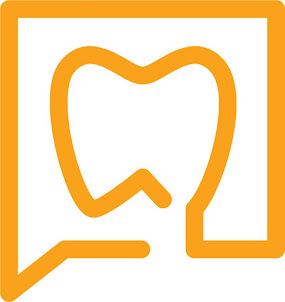 If a coronal barrier can be placed, without exposure (and possible contamination) of the pulpal tissue, then it would seem that internal bleaching could be performed without the need for complete endodontic therapy. Long term recall to monitor vitality will be done with this type of approach. Adeleke O Oginni and Comfort A Adekoya-Sofowora "Pulpal sequelae after trauma to anterior teeth among adult Nigerian dental patients", BMC Oral Health 2007, 7:11doi:10.1186/1472-6831-7-11. Great example of thinking out of the box!!!! It steers dentists away from the "tunnel vision" that every tooth has to have a root canal before internal bleaching, and makes a clinician evaluate each case carefully and think it through! 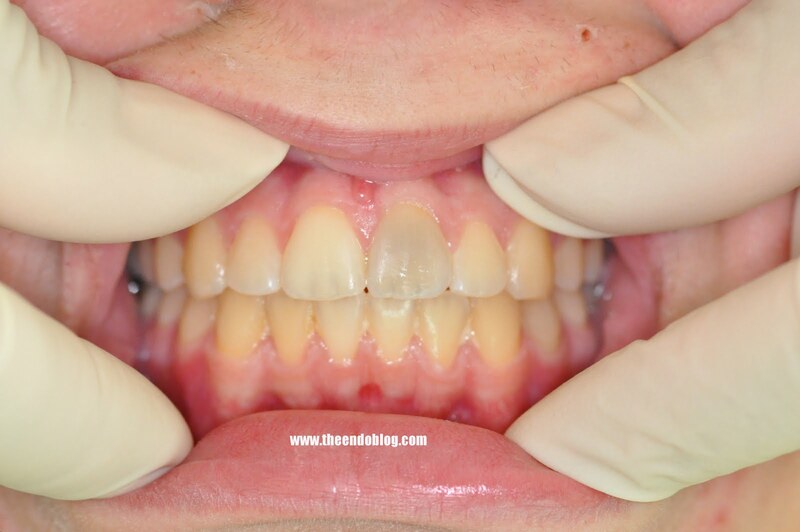 Occasionally, on PCO teeth, just an access opening (with out bleaching agent) may make the tooth look more esthetic and gain some translucency. It would be nice to see this in a year. Nice result! - if the periapical lesion was preesent, how to treat it? Only apical surgery can be done. Orthograde treatment is not the candidate, isn't it? - from the literature of andreason 1985 and robertson 1996, necrotic and periapical lesion were developed after the pulp canal obliteraton in a small percentage. But when the the present of bleaching agent as a stimuli, the percentage might be increased. Then the external bleaching might be preferred. This is a nice blog..this is what i was searching..thanks alot fr sharing this.. Thanks for your thoughtful questions. In this particular case, I did thermal testing during diagnostics. However, in retrospect, I should have done electric pulp testing. We will monitor vitality at recall using EPT. If additional treatment is needed, a non-surgical retreatment is easily performed. No need for surgery. 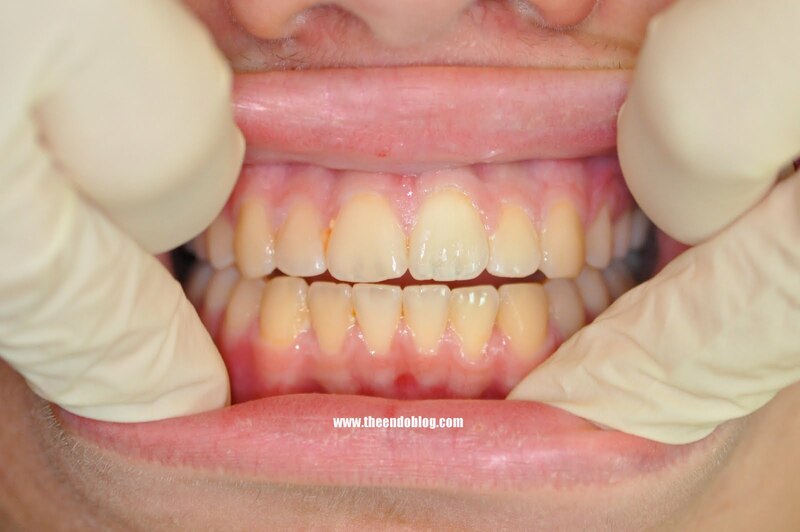 I must say that external bleaching will not achieve the desired result in this case because the problem is the loss of translucency and matt appearance more so than color. Agree on EPT though. I say if PCO continues then there is vitality (odontoblasts are alive, so there is blood supply). Not too surprising that kids under 12 suffer tooth trauma so frequently...I chipped three teeth before I was eight!